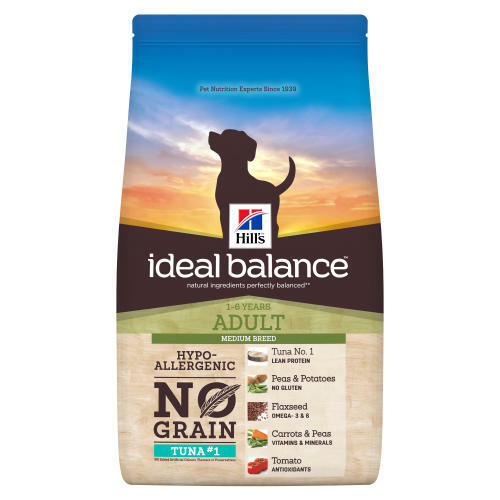 Hills Ideal Balance No Grain Tuna & Potato is a delicious dry food that has perfectly balanced nutrition. Made with natural ingredients, it contains 70% animal protein, plus vitamins, minerals and amino acids. Completely free from grains, it’s ideal for dogs with sensitive stomachs. Tuna provides a lean protein source, great for growth and repair. Rich in omega -3 & -6 to support healthy skin & coat. Tuna meal (21%), potato starch, dried potato (14%), , yellow peas (13%), dried peas (13%), animal fat, digest, vegetable oil, flaxseed (1%), dried beet pulp, minerals, dried carrots (0.5%), tomato pomace (0.2%), spinach powder, grape pomace, citrus pulp, vitamins, trace elements and beta-carotene. With a natural antioxidant (mixed tocopherols).